Cocoon is a 1985 American science-fiction fantasy comedy-drama film directed by Ron Howard about a group of elderly people rejuvenated by aliens. The movie stars Don Ameche, Wilford Brimley, Hume Cronyn, Brian Dennehy, Jack Gilford, Steve Guttenberg, Maureen Stapleton, Jessica Tandy, Gwen Verdon, Herta Ware, Tahnee Welch, and Linda Harrison. The screenplay was written by Tom Benedek, from David Saperstein's story. The film was shot in and around St. Petersburg, Florida: locations included the St. Petersburg Shuffleboard Club, Sunny Shores Rest Home, The Coliseum, and Snell Arcade buildings. The film earned two Academy Awards for Best Supporting Actor (Don Ameche) and for Best Visual Effects. 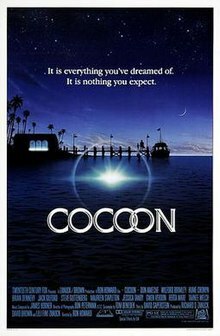 A sequel, Cocoon: The Return, was released in 1988, in which almost all of the original cast reprised their roles. Robert Zemeckis was originally hired as director, but after spending a year working on it in development, he was fired before production began as 20th Century Fox (the studio financing Cocoon) felt he was box office poison, due to his films I Wanna Hold Your Hand and Used Cars both being critically acclaimed, but commercial failures, and the studio felt his then-current film with Fox, Romancing the Stone would also be a flop after the studio previewed it, so Ron Howard was then hired as director. Romancing the Stone turned out to be a huge commercial success and gave Zemeckis the clout to do Back to the Future which he had already scripted and had been previously turned down by every major studio. About 10,000 years ago, peaceful aliens from the planet Antarea set up an outpost on Earth on Atlantis. When Atlantis sank, twenty aliens were left behind, kept alive in large rock-like cocoons at the bottom of the ocean. Now, a group of Antareans have returned to collect them. Disguising themselves as humans, they rent a house with a swimming pool and charge the water with "life force" to give the cocooned Antareans energy to survive the trip home. They charter a boat from a local captain named Jack, who helps them retrieve the cocoons. Jack spies on Kitty, a beautiful woman from the team who chartered his boat, while she undresses in her cabin, and discovers that she is an alien. After the aliens reveal themselves to him and explain what's going on, he decides to help them. Next door to the house the Antareans are renting is a retirement home. Three of its residents, Ben, Arthur, and Joe, often trespass to swim in the pool next door. They absorb some of the life force, making them feel younger and stronger. Eventually caught in the act, they are given permission to use the pool by the Antarean leader, Walter, on the condition that they do not touch the cocoons or tell anybody else about it. Rejuvenated with youthful energy, the three men begin to let the advantages of the pool take hold as they are relieved of their ailments. Meanwhile, Kitty and Jack grow closer and decide to make love in the pool. Since she cannot do so in the human manner, she introduces him to the Antarean equivalent, in which she shares her lifeforce energy with him. The other retirement home residents become suspicious after witnessing Ben's wife Mary climb a tree. Their friend Bernie reveals the secret of the pool to the other residents, who rush to the pool to swim in its waters. When Walter finds them damaging one of the cocoons he ejects them from the property. Later that evening, Bernie finds his wife Rose (Herta Ware) has stopped breathing and carries her body to the pool in an attempt to heal her, only to be informed by Walter that the pool no longer works due to the other residents draining the force in the rush to make themselves young. Walter explains that the cocoons cannot now survive the trip back to Antarea, but will be able to survive on Earth. With the help of Jack, Ben, Arthur and Joe, the Antareans return the cocoons to the sea. The Antareans offer to take residents of the retirement home with them to Antarea, where they will never grow older and never die. Most of them accept the offer, but Bernie chooses to remain on Earth. Upon leaving, Ben tells his grandson, David (Barret Oliver), that he and Mary are leaving for good. As the residents are leaving, David's mother Susan finds out about their destination and quickly drives to the retirement home, where they find the majority of the rooms vacant and contact local authorities. While the police are searching for the residents, David notices the boat starting and jumps onto the side as it pulls away. The boat is being chased by the Coast Guard, so with little time left, David says a tearful goodbye to Ben and Mary before jumping off into the water. The Coast Guard boats stop to pick him up, giving the others a chance to get away. Out of nowhere, a thick fog appears and strands the remaining Coast Guard boats and they call off the chase. As the Antarean ship appears, Walter pays Jack for his services and the boat. Jack embraces Kitty for the last time and they share a kiss. He then says farewell to everyone before jumping into an inflatable raft as the boat starts rising up into the Antarean vessel. Jack watches as the boat disappears inside the ship and departs. Back on earth, a funeral is held for the missing residents. During the sermon, David looks toward the sky and smiles. The film ends with the Antarean vessel going towards a bright looking planet, assumed to be Antarea. Casting for the film and its sequel were overseen by casting director Beverly McDermott. The score for Cocoon was composed and conducted by James Horner. The soundtrack was released twice, through Polydor Records in 1985 and a reprint through P.E.G. in 1997 and features eleven tracks of score and a vocal track performed by Michael Sembello. Despite the reprint, it is still considered a rarity among soundtrack collectors. Ron Howard directed the music video for "Gravity," and also has a cameo appearance as himself, investigating Sembello's "disappearance." "Gravity" was Howard's first, and to date, only music video. In 2013, Intrada released an expanded and remastered edition. The film received mostly positive critical reception. Commented The New York Times' Janet Maslin, "Mr. Howard brings a real sweetness to his subject, as does the film's fine cast of veteran stars; he has also given Cocoon the bright, expansive look of a hot-weather hit. And even when the film begins to falter, as it does in its latter sections, Mr. Howard's touch remains reasonably steady. He does the most he can with material that, after an immensely promising opening, heads into the predictable territory of Spielberg-inspired beatific science fiction." Variety called it "a fountain of youth fable which imaginatively melds galaxy fantasy with the lives of aging mortals in a Florida retirement home [and] weaves a mesmerizing tale." The film holds an 80% "Fresh" rating on Rotten Tomatoes. The film was also a box office hit, making over $76 million in North America where it became the sixth highest-grossing film of 1985. Best Visual Effects in 1985 (David Berry, Scott Farrar, Ralph McQuarrie and Ken Ralston). ^ "Perry Moore, 'Narnia' series executive producer, dies at 39; Don Peterman, Oscar-nominated cinematographer, dies at 79; Nancy Carr, network TV publicist, dies at 50". Los Angeles Times. February 22, 2011. Retrieved February 23, 2011. ^ "COCOON (PG) (!)". British Board of Film Classification. August 15, 1985. Retrieved July 10, 2015. ^ "Cocoon' Is 50th Film For Gentleman Star". The Morning Call. Retrieved November 7, 2010. ^ "Cocoon (1985)". Box Office Mojo. September 29, 1985. Retrieved October 19, 2011. ^ "Hot Howard Actor-turned-director Makes Another Splash With `Cocoon`". Sun Sentinel. Retrieved November 7, 2010. ^ Friendly, David T. (June 12, 1985). "Back In Splash Of Things With Cocoon". The Los Angeles Times. Retrieved November 7, 2010. ^ Cynthia Whitcomb (2017). The Heart of the Film: Writing Love Stories in Screenplays. Taylor & Francis. p. 93. ISBN 978-1-315-51320-1. ^ Broeske, Pat H. (November 27, 1988). "Cocoon & Its Sequels". The Los Angeles Times. Retrieved November 7, 2010. ^ "$1 Billion in Grosses?". Retrieved September 2, 2017. ^ "Character study: Kitty". The Rush. UGO Film and TV. Archived from the original on February 22, 2014. ^ Jicha, Tom (January 20, 2012). "Beverly McDermott, top casting director and Hollywood resident, dies". South Florida Sun-Sentinel. Archived from the original on February 11, 2012. Retrieved January 22, 2012. ^ "Filmtracks". Filmtracks. September 10, 1997. Retrieved October 19, 2011. ^ Maslin, Janet (June 21, 1985). "Screen: 'cocoon' opens". The New York Times. Retrieved November 7, 2010. ^ "Cocoon". Variety. December 31, 1984. Retrieved November 7, 2010. ^ "Cocoon". Rotten Tomatoes. Retrieved November 21, 2011. ^ Heise, Kenan (December 8, 1993). "Oscar-winning Actor Don Ameche, 85". Chicago Tribune. Retrieved November 7, 2010. ^ Flint, Peter B. (December 8, 1993). "Don Ameche Is Dead at 85; Oscar Winner for 'Cocoon'". The New York Times. Retrieved November 7, 2010. ^ "AFI's 100 Years...100 Cheers Nominees" (PDF). Retrieved August 14, 2016.